Ignaz "Igo" Etrich (December 25, 1879 in Ober Altstadt (Bohemia / Austria-Hungary, Sudetenland) near Trautenau (today: Horni stare mesto near Trutnov, Czech Republic) – February 4, 1967 Salzburg, Austria), Austrian flight pioneer, pilot and fixed-wing aircraft developer. 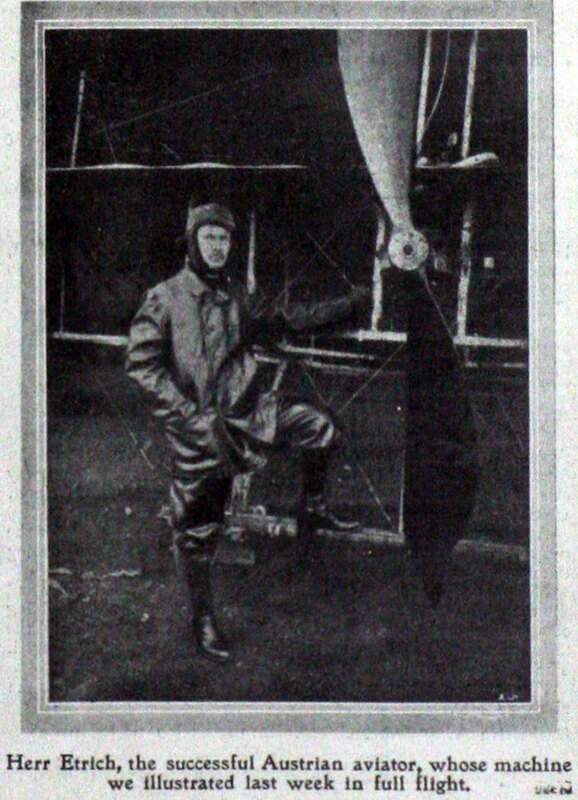 Igo went to school at Leipzig, where he came in contact with the works of Otto Lilienthal. His main interest was in aviation, the problems of bird flight. With his father, a factory-owner, he built a laboratory for developing aeroplanes. After the death of Lilienthal his father acquired some advanced gliders. After reading the books of Prof. Ahlborn about flying seeds, in 1903 he developed his first gliders (called Zanonia) inspired by the flying seed of Zanonia macrocarpa. He worked together with Franz Xaver Wels and Karl Illner, two men who would become very important for future development and flying. In 1906 Karl Illner was the first Austrian to fly an Austrian-built glider. Igo Etrich went to Vienna, where he had his second laboratory in the Wiener Prater at the Rotunde. In 1907 he built his Etrich I, the Praterspatz (Sparrow of the Prater) there. Due to the low power (24 hp) of the motor and the limited space for flying, the plane was not a success. In 1909 in Wiener Neustadt the first airfield of the Austro-Hungarian Empire was founded. Etrich rented two hangars (or aircraft-sheds, as they were called then) and continued to develop his success, the Taube. Meanwhile his co-developer Franz Xaver Wels visited Paris to study the planes of the Wright Brothers and split with Etrich over the question of whether to build a monoplane or a biplane. In 1910 his Etrich II, the Etrich-Taube (Dove) made its maiden flight. This success was aided by another world-famous engine developer: Ferdinand Porsche, who designed the reliable 65 hp Austro-Daimler engine (reliability, a crucial factor in aviation, was poor in these days), which powered this plane. 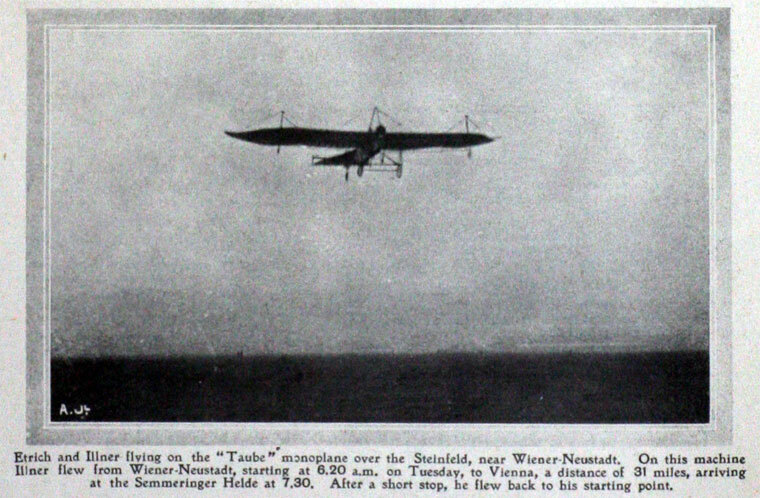 In one of the first flights, Etrich nearly broke his spine when his Taube fell tail-first to earth. From then on, the skilled Karl Illner made all the flights for Etrich. Etrich refined his Taube to meet the requirement of the military, that a plane had to be able to land on a freshly plowed field. In 1912 he founded his Etrich-Fliegerwerke in Liebau (today Lubawka, Poland) and designed the first passenger plane with a totally closed cabin for the passengers, his Luft-Limousine. Later he moved to Germany, founding the famous Brandenburgischen Fliegerwerke. From Liebau he took his major designer with him - Ernst Heinkel. Another aircraft designer, Rumpler, modified the design of the Taube slightly, claimed to be the developer and refused to pay licensing fees to Etrich. After a short dispute in court, Etrich conceded on the advent of World War I, and made the design for his Taube freely available. After WW1 Etrich went to the newly-founded Czechoslovakia, and built another plane: his Sport-Taube. Legend has it that it flew faster (equipped with only a 40 hp engine) than the Czech military planes of the time. The authorities claimed he built the plane for smuggling and impounded his plane. The Etrich II can be seen at the "Technisches Museum" in Vienna, Austria. The Sport-Taube can be seen at the "Technischen Museum Prague" . This page was last edited on 3 January 2019, at 13:22.